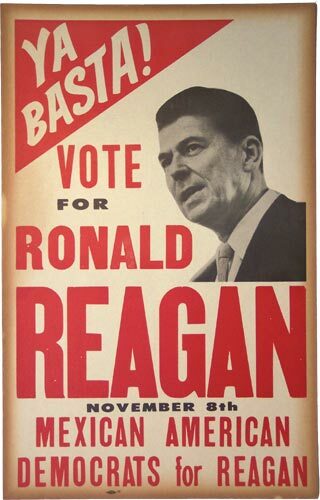 Reagan campaign poster. Reprinted from my book, The Search for a Civic Voice: California Latino Politics. Ya Basta translated into “Had Enough?”, a phrase intended capture multiple frustrations held by Mexican Americans. The mid-sixties was a time when the long-dominant Democratic New Deal coalition, in the aftermath of the party’s 1964 landslide, was coming apart. The author seeks to place Mexican American support for the former actor in the context of state and national politics in the mid-sixties. Liberal activists were angry with Governor Pat Brown and President Lyndon Johnson for failing to meet the rising expectations among Mexican Americans for appointments and policy changes during the first half of the 1960s. Activists and elected officials alike criticized Johnson for funneling more Great Society resources into African American neighborhoods than into Latino enclaves, despite there being more low-income Mexican Americans than blacks in California. At the same time, some culturally conservative Mexican Americans joined the larger Anglo backlash protesting against the social upheaval of the era as symbolized by the Watts riots and student demonstrations at UC Berkeley. Dr. Francisco Bravo plays a major role in Kopelson’s story, even more than the author explained. Bravo was a prosperous associate of Los Angeles Mayor Sam Yorty. He owned health clinics, ranch land, and the Pan-American National Bank. Bravo was instrumental in Yorty’s come-from-behind 1961 mayoral election in Los Angeles: in that election, Yorty formed a coalition of alienated voter blocs that included Latinos from the Eastside, blacks from South Central, and Anglos in the San Fernando Valley. The populist Yorty nurtured his Latino supporters; he appointed Richard Tafoya as the first Latino deputy mayor (although it had a different title). Yorty backed Tafoya, a cousin of Edward Roybal, for Roybal’s open city-council seat after he left for Congress in 1963. Progressive and liberal Democrats slit their support; many backed his opponent, the victorious Gilbert Lindsey, an African American labor leader. This contributed to a for depressing reality for Latinos that in 1966 three blacks and no Latinos served on the Los Angeles City Council. This local situation fueled tension between the two main minority groups within the Democratic coalition, reinforcing anger over stat and national events. Yorty’s support for Los Angeles Latinos helps explain continuing (but not total) Latino support for Yorty, even as he lost the backing of African Americans. This dynamic of rising Latino expectations, anger at liberals who seem more sympathetic to black interests than Latino concerns, and the rise of conservatism are all covered in my book, The Search for a Civic Voice: California Latino Politics (2007). Yorty challenged Brown from the right in the June 1966 Democratic gubernatorial primary. He failed to win but succeeded in politically bruising Brown. After the primary, Yorty encouraged Bravo to support Reagan, a former New Deal Democrat. Reagan and Bravo met in late June 1966, and the GOP designed a strategy to court dissatisfied Latinos whose votes were up for grabs. The renewed interest in the Latino vote in the critical 1966 election is timely. The story would have been stronger if the author had fleshed out the growing divisions within the Democratic Party and the history of Republican appeals to Latinos. He could have strengthened the piece utilizing the most salient academic literature and spent time in the Ronald Reagan Presidential Library and other archives. Hopefully, one of you readers will undertake such an admittedly time-consuming project in the future. Readers interested in this subject are encouraged to read Richard Santillan and Federoco A. Subervi-Veles, “Latino Participation in Republican Party Politics in California,” in Byran O. Jackson and Michael B. Preston, Racial and Ethnic Politics in California (Berkeley: IGS Press, 1991), my book and recent article, “Pat Brown and the Emergence of Latinos in California Politics,” published by the Pat Brown Institute at California State University, Los Angeles. All this is to say that the history of Latino activism related to the Republican Party is complicated and important. The recent article on the role of Mexican Americans in the pivotal 1966 campaign (which served as a precursor for the Nixon presidential victory in 1968) helps direct new attention to this subject. It merits further attention. This entry was posted in Activist Profiles, California and tagged Pat Brown, Republicans, Ronald Reagan. Bookmark the permalink.